It is that time again! A few suggestions for holiday shopping if you’re the book-giving kind. Which I’m guessing you are. The Goodnight Train by June Sobel and Laura Huliska-Beith. It took me a couple of readings to really warm to this one, but the rhythm of the text and the clever little details on each page won me over. A nice addition to a stack of bedtime books. Animal Spots and Stripes by Britta Teckentrup. This one is right on the border between board book and regular book. It’s more the size of a regular book and the page are thick and strong, but not technically board. It’s so fun to see the combinations of striped and spotted animals on each page and every child who I’ve showed these books to loves to open the flaps. What child DOESN’T love a book with flaps, though? What Do You Say? by Mandy Stanley. Look, any animal book is going to go over very well in our home. And this one is no exception. We love making the animal sounds and the final page about what a fish says made all of us laugh. I Love to Eat by Amelie Graux. This book about basic accoutrements of eating (high chair, cup, utensils, a few food items) has the names of each object in three languages and each picture is textured. I thought Ella might be too old for these, but she loves them and chooses them on a regular basis. The slightly sticky green peas are my favorite. I Say, You Say: Opposites! by Tad Carpenter. I love flap books when they are of the board book variety because they are just so much less destructible. This one is full of bright colors and bold drawings and features lots of animals, so obviously it’s a hit in our home. (There is also a darling animal sounds version that will be under the tree for Ella this year). Where is the Green Sheep? by Mem Fox and Judy Horacek. This is one we discovered at the library, when Ella did her weekly “take-ten-board-books-off-the-shelf-and-make-me-read-them-all” and then we read this one multiple times. Apparently it’s a fairly popular book, so maybe you all know it already, but I found it delightful and Ella was vastly amused by it. So many funny little details in this book, which makes me happy. What’s Wrong, Little Pookie? by Sandra Boynton. 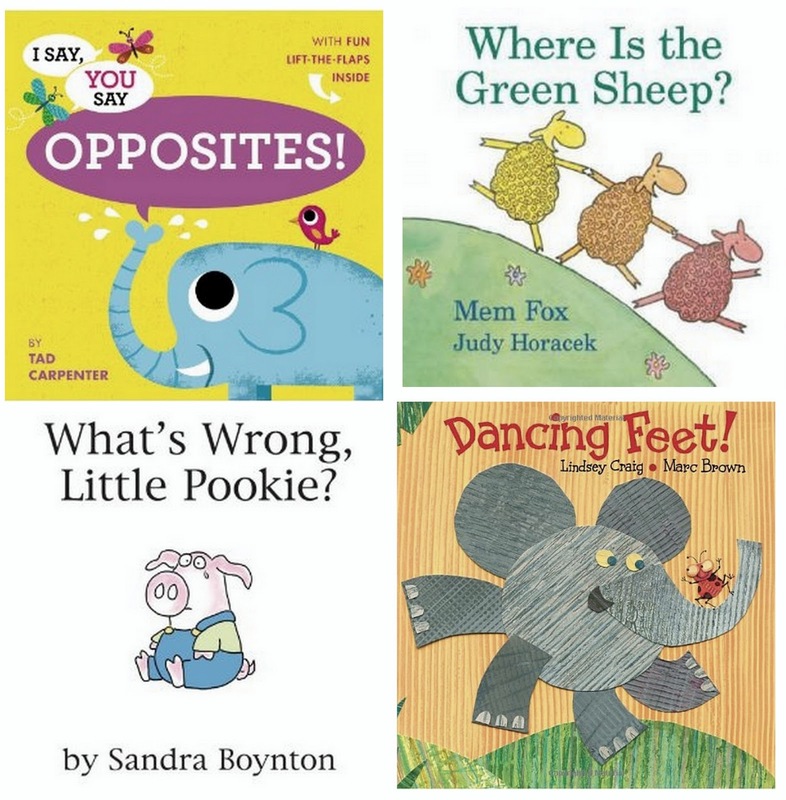 I love Sandra Boynton, but her Little Pookie books are some of my favorite and they seem to be a little less popular than some of her other titles. This one, with a little sad pig who makes his mom guess what is causing him angst, is one of Ella’s favorites. Dancing Feet by Lindsey Craig and Marc Brown. Be warned, you will be chanting the catchy rhymes in this book for the rest of the year. But it will be worth it. Still looking for more ideas? 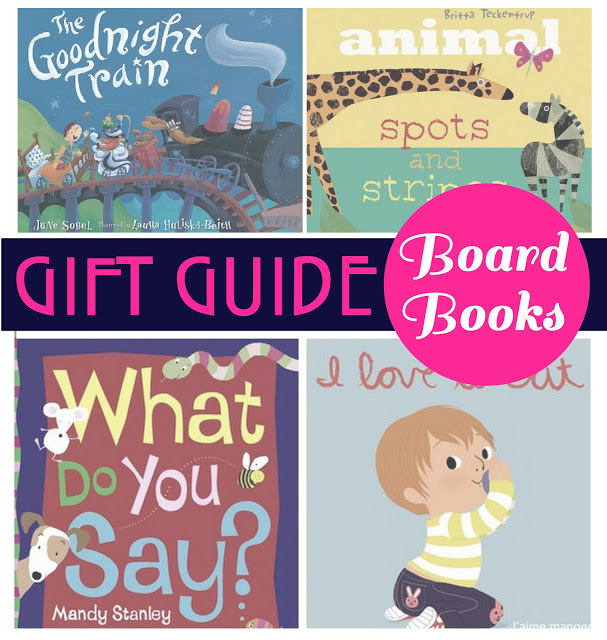 Here’s last year’s board book gift guide and all the board books I’ve reviewed over the last couple of years. would be THRILLED if you’d leave them in the comments. Lots of your links to amazon on this post appear to be broken. Just in case you wanted to know. Love your recommendations. So helpful. Thanks as always for the recommendations. We're always in need of new stories around here. We are currently enjoying Les Petits Fairytales by Trixie Bell and Melissa Caruso-Scott. They currently have two out: Snow White and Cinderella. I think they are very clever and my boy seems to enjoy the simple, colorful pictures. Although I don't currently have anyone in need of board books, I love reading your suggestions and comments. "What Do You Say?" reminded me of a story from my daughter's toddlerhood. She was about three at the time and we often would talk about animal sounds as a way to pass the time in the car. One day, she had reached the end of her rope and said, "DAAAdddy! Don't moo, DON'T bark, DON'T meow, OR ANYTHING!!!" I actually didn't know there was a board book edition of "Where is the Green Sheep?" It is one of our very favorites (we love almost everything by Mem Fox). And lately we have really been enjoying "Chomp!" by Heather Brown. P.S. I'm dying to know about your baby! I love children's books! I love dancing feet, I know I have told you before, but so cute…she also has a book called farmyard beet, equally adorable and catchy. You'll have to check that one out!